Americans have always loved guns, whether for good intentions or bad. Social movements have lobbied both in favor of guns and opposing them. Frontier history, police violence, personal security, mass shootings, and so many other aspects of life in the U.S. have involved guns. Personally, I have a gun owner’s perspective and I care about my rights, which are from the U.S. Constitution’s Second Amendment. My bias goes deeper, as I actually come from a family with some military background. To say I have held and even used a few guns is an understatement. However, that does not mean I agree with the violence that happens every day in the use of these commodities. For instance, the fact that one of my friends was able to become a gun owner in California, even though he has a past both criminally and medically, is disturbing to me. It is interesting that, in a state so concerned with gun control, the one regulation the state should have enforced was not enforced. I am an avid gun enthusiast, but that does not mean I think everyone should be allowed to own a gun, or even be allowed near them. These types of nuanced opinions, however, are absent from the political battles around gun ownership. Hillary Clinton took an avidly anti-gun stance while she ran against Donald Trump. Whether is was helping to “build on the Brady Bill’s success” (Hillary), which is why we have federal background checks, or the fact that she did not want military-style weapons on our streets, Clinton was determined to impact gun owners with more regulations and enforcement if she had become president. These objectives were openly degraded by Donald Trump, who consistently stated that Clinton would only “threaten the Second Amendment by appointing a far-left justice to the U.S. Supreme Court” (Gorman). It should be interesting to see what Trump does in office to, as he puts it, uphold the Second Amendment. 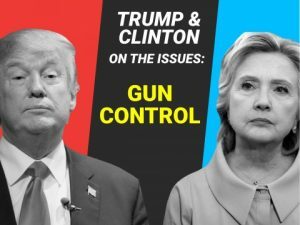 Trump quickly gained support from the NRA (National Rifle Association), which opposed Hillary as well anti-gun movements. The West Coast was a prime regon for pro-gun supporters spread their agendas. “Anti-gun groups from Washington and Oregon called for a ban on popular and commonly-owned semi-automatic firearms. This ban is right out of the Bloomberg/Clinton playbook and would do nothing to prevent crime. Criminals, by definition, do not follow the laws and will continue to obtain their firearms illegally, like they always have. This ban would only affect law-abiding gun owners who use these firearms for recreational target shooting, hunting, and self-defense” (National 2016). As Clinton retorted, “We are smart enough — compassionate enough — to figure out how to balance legitimate Second Amendment rights with preventive measures” (Diamond). 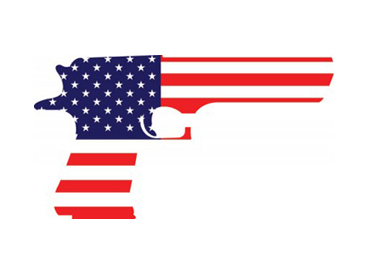 The Second Amendment is not going away anytime soon, it is just “too American.” But preventive measures must come soon or we will continue to see a rise in mass shootings and other gun-related killings. Suicide is never a good thing, both on an individual and communal level. The impacts ripple through our lives in such detrimental ways. When you take into consideration the fact that more “than 60 percent of people in this country who die from guns die by suicide” (Sanger-Katz), it is not surprising that President Trump believes this “isn’t a gun problem, this is a mental problem” (Diamond). He did not want to increase any gun restrictions at that time he said that back in 2015. Trump currently has such goals as wanting “to abolish gun-free zones at schools and on military bases” (Gorman), which he believes is a major problem. He wants people to have more opportunities for personal security, but he is not actually addressing what he claims is the problem: mental health. Maybe allowing soldiers more gun freedom on military bases where suicide is prevalent is not the answer to fixing gun-related issues. A study of Israeli soldiers in 2006 noticed that the “suicide rate fell there, too, by 40 percent” (Sanger-Katz) when “the army stopped letting soldiers take their service weapons home on weekends” (Sanger-Katz). The numbers speak for themselves, but only further implementation of such restrictions will show progress in the long run. “Nearly everything gets blamed for suicide at one time or another–love, hate, religion, pain, boredom, fear, shame, guilt, alcoholism, drug addiction, family dissolution, loss of a job, a new job, the news media, music, the time of year, terminal illness, old age and even the weather” (National 1999). “It seems quite unlikely that the relative availability of handguns plays a significant part in explaining why some states have higher rates of acts of violence associated with firearms than others” (National 1999). “GAGV works collaboratively with other groups to reduce gun violence. We are an active, enduring, effective organization, and we show up, speak up and stand up for gun sense and responsibility. Our strength is in our numbers and our persistence. We are grass roots with deep roots and, as grandmothers, we seek a safer world for our children and for theirs” (Grandmothers). I never would have guessed that such a lovely little group could do so much. In January 2017, they actually brandished their Grandmothers Against Gun Violence banner during the Women’s March. They also showed up at the State Capitol a few days later to represent the same ideals they have been expressing for years, and they were dressed in orange. 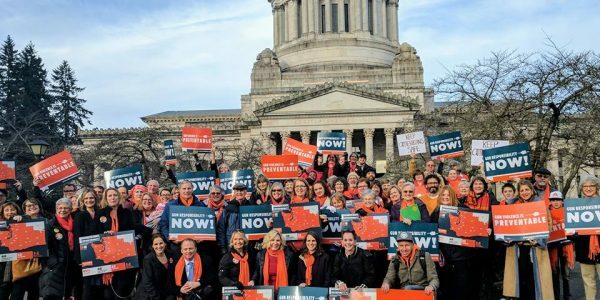 “A sea of orange waited for 3 1/2 hours and then filled the hearing room for Dangerous Access Prevention and Enhanced Assault Weapons Background Checks” (Grandmothers). These women have banded together and because of this communal power, their voices are being heard. 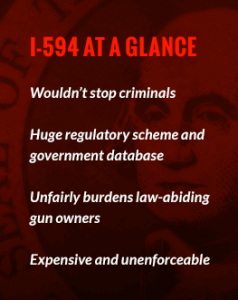 Initiative 594 in Washington State addresses gun issues more so than other recent regulations, as more extensive background checks are now mandatory for gun sales. This is what President Obama tried to accomplish during his time in office. The previous “president’s proposals is probably his call to beef up the existing background check requirement so that it covers private sales as well as licensed dealers” (Douthat). He did not want to ‘take away all of our guns’ like many people believe, but “his intent was to enhance our nation’s domestic security” (Odinson). We see that being implemented in our state with the enforcement of I-594. However, mental crisis is, at least in my opinion, still one most common leading causes of preventable death when it comes to gun owners. With better regulatory enforcement towards people who are suffering from some kind of extreme distress, those increasing death counts might start to decrease. Initiatives such as I-594, with perhaps annual background checks, are exactly what we need in order to cut those numbers down. But we have to remember not blame the gun. 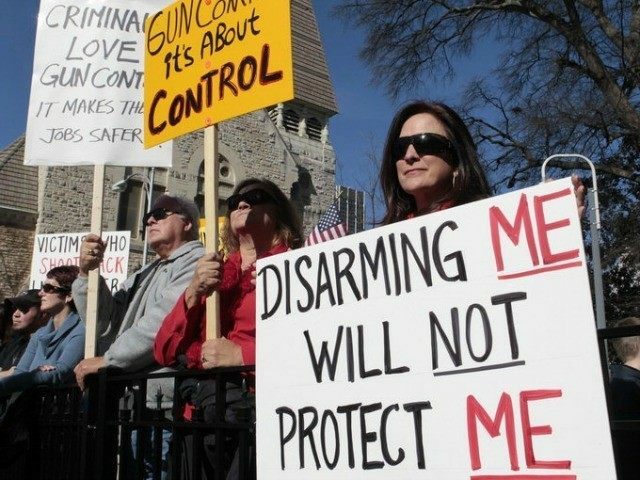 “The NRA has warned about the anti-gun-rights movement using the suicide and guns issue to promote their anti-second amendment agenda” (Nappen). People will do terrible things with or without the support of a gun. It is rather the at-risk individual who can be identified, and more preventative measures should be taken to support healthy societal relations with guns instead of the other way around. “Initiative 594 is a universal handgun registration scheme being promoted by a very wealthy group of anti-gun elitists who have already raised more than $7 million to qualify and pass this initiative. Although they describe it as a ‘universal background check’ measure, it is not universal because criminals will never comply with the requirements. It is, however, universal handgun registration. Under I-594, every time a handgun is transferred, the person receiving the handgun will have their name added to the government database being maintained by the state Department of Licensing” (National 2014). Coming from a registered gun owner’s perspective, being on a federal database is not nearly as bad as the NRAmakes it seem. My handgun is neither less mine nor am I less able to go get more guns because of this enactment. This Initiative just allows proper documentation and I think that is a positive move, considering that people used to be able to just give away their guns or sell them without any kind of notification in ownership change. The NRA goes on to say that “virtually every firearm transfer – with very few and limited exceptions – would be required to go through a licensed firearms dealer under the provisions of I-594” (Vote). This seems to be the NRA’s biggest concern while using opposition to a ‘government database’ as a cover. As the NRA states, all I-594 does is “unfairly burden law-abiding gun owners” (National 2014). I do not feel burdened by this Initiative and I am a law-abiding gun owner. Even if some day I wanted to sell my gun, I would not feel burdened simply because I have to do it through a licensed dealer like this new law demands. When this Initiative passed a few years ago, some conservative gun owners lost their rationality. Believing this would completely invalidate their gun ownership and take away their guns, they quickly showed their unappreciative opinions. “The antis will never be satisfied until guns are banned, confiscated, and we are all defenseless, hapless victims depending on state protection. ‘We aren’t coming for your guns’ they say. Not today, but here in Washington we’re on the highway to Hell with a bus full of wealthy elitists asking, ‘are we there yet? '” (Farago). You would think that legal, documented gun sales would decrease with such resistance against this initiative, but they have actually increased since I-594 was passed and continue to rise today. A statistical study last year found that the “National Instant Criminal Background Check System processed 2,197,169 requests in July, about 66,000 more than in June and a 37 percent jump from July 2015” (Bunker). I see more gun regulations coming, despite Trump’s victory. 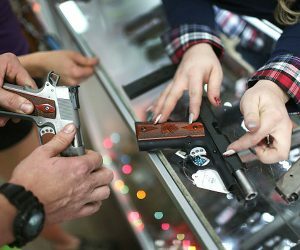 2017 will definitely be eventful for gun owners like myself, as well as the rest of the U.S., especially because of recent anti-gun activism and “their victories in California, Nevada, and Washington State as evidence that their patchwork approach to reforming gun-control laws nationwide, one state at a time, is gaining steam” (Porter). More initiatives and laws will be here soon enough, and I do not believe they will affect gun owners like myself too extensively, but only time will tell. Brady Campaign to Prevent Gun Violence. (2017, February). The Brady Campaign. Bunker, T. (2016, August 4). 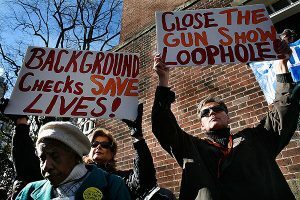 Gun Demand Soars as Background Checks Set Records. Newsmax. 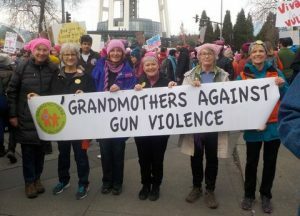 Grandmothers Against Gun Violence. (2017). Grandmothers Join Alliance On Hearing Day. GAGV. Hillary for America. (2016). Hillary Clinton Believes It’s Time to Act on Gun Violence. The Briefing. National Rifle Association. (2014). Vote NO I-594. NRA. National Rifle Association ILA. (1999, November). Suicide And Firearms. NRA-ILA. Nappen, E. F. (2011, September). Anti-Gun Groups Using Suicide to Trick Gun Retailers into Doing the Dirty Work. Ammoland. Odinson, B. (2013, July). Pro-Gun Activist: “If it’ll keep me a free person i’ll kill 30k just myself.”. Coalition to Stop Gun Violence.